This is our highest capacity LED Converter. 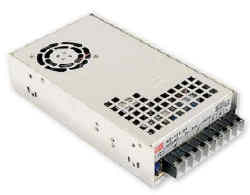 Like our lower power models, it features universal AC input (90-264VAC) and delivers steady voltage-regulated 24V DC power; ideal for sensitive electronics and LED lighting. It features resettable short circuit protection, thermal regulation, and adjustable over-current protection. Completely water-proof, this unit may be safely used for indoor or outdoor applications.